Mead's Bay is long, soft, inviting and quiet! Great for a stroll and a walk and talk with your honey or a jog or a swim! Nori's Reply: Indeed, Kevin and Sharon! You never know what you are going to see nature-wise on a Meads Bay stroll or swim. One afternoon a friend of mine was swimming alongside a baby manta ray! Completely harmless, he just glided back and forth in front of Carimar Beach Club. Other times of the year, you have to watch where you step. Large leatherback turtles come to nest and lay their eggs on Meads Bay. Usually, the nesting area is marked. The sights are plenty on Meads Bay! And the sand so soft, and the beach so long, as you said. There are also many options for lunch, including Straw Hat, Blanchards Beach Shack and Jacala. These three favorites are also open for dinner! And, if you love Meads Bay so much that you want to call it home throughout your vacation, there are many lovely accommodation options here too, ranging from the low-cost to the high-end. 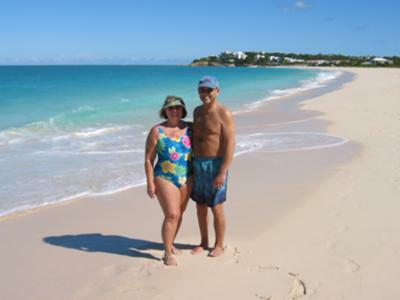 Meads Bay is one of the island's best big beaches. It really has it all!